« It’s a Blog Hop! Matthew Goodman does an excellent job bringing these two women to life, filling in the background of exotic locations and Victorian attitudes as they make their remarkable journey—not just around the world, but through life. In his prologue, Goodman sets up the reader with vivid descriptions of the two journalists leaving on November 14, 1898. He then backtracks to tell each of their stories and the ambitions that led to their history-making race. In a tactic used throughout the book, this leads to exploring the history of women in journalism up to that time—a remarkable tale—introducing the reader to a raft of intrepid women who covered politics, corruption and social justice issues; as well as tea parties and fashion shows in an era hostile towards women in any public role. Can they that have full and plenty of this world’s goods realize what it is to be a poor working woman, abiding in one or two bare rooms, without fire enough to keep warm, while her threadbare clothes refuse to protect her from the wind and cold, and then denying herself the necessary food that her little ones may not go hungry; fearing the landlord’s, frown and threat to cast her out and sell what little she has, begging for employment of any kind that she may earn enough to pay for the bare rooms she calls home, no one to speak kindly to or encourage her, nothing to make life worth the living. Bly continued her crusading stories with an eight-part series on the plight of factory women. She traveled to Mexico for five months and reported from there, proving that “a free American girl can accommodate herself to circumstances without the aid of a man.” Returning from Mexico, Bly dreaded returning to the ghetto of the women’s pages. She left the Dispatch, with a brief note, “I am off to New York. Look out for me. Bly.” There, she continued her reporting career at Joseph Pulitzer’s The World newspaper, specializing in undercover assignments exposing abuse and corruption in public institutions. It was here she proposed to her editors that she travel around the world in seventy-five days. They agreed and set about an extraordinary publicity campaign. As Pittsburg couldn’t hold Bly, New Orleans couldn’t hold Bisland. She traveled to New York with fifty dollars and recommendations from literary and newspaper friends. Her first contact told her, “My dear little girl, pack your trunk and go back home. This is no place for you.” Undeterred, she submitted articles and soon had work writing features and book reviews for the Sun, Harper’s Bazaar, Illustrated American and Puck. Extremely hard working, she became well known among the literary set and created a Sunday afternoon salon frequented by famous actors, poets and writers. She finally settled with The Cosmopolitan, a monthly magazine run by John Bisben Walker, writing features and literary criticism. 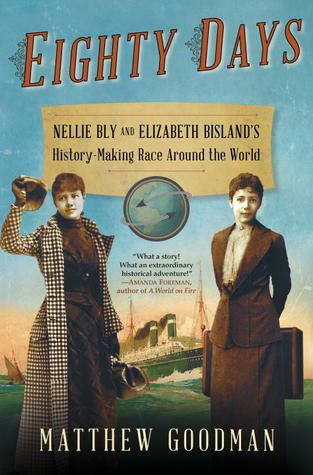 On the morning Nellie Bly set out on her journey, Walker called Bisland to his office and asked if she could leave that day for a trip around the world. After some strenuous persuading on Walker’s part—including a considerable boost in salary—Bisland agreed. Here’s where Goodman’s writing and research come to play. For these two women setting out with little luggage and no companions on a journey never attempted by a single woman before, this was a daunting task and the adventure of a lifetime. However, to the modern reader, it could be deadly dull. The majority of the time Bly and Bisland traveled by steamship and rail; well attended by captains, pursers and agents at every port and transition. A few minor glitches and the occasional layover at an exotic locale add spice to the narrative, but mostly they hung out on board ship. Goodman breaks up the journey with witty insights and superb research on everything from the passengers and the nature of the steamships to the overwhelming influence of the world-wide British Empire. He packs in an incredible amount of history, geography, science and geopolitics. It’s not until the final leg, when bad weather (and possible dirty tricks) looks to defeat both women in making their goal, that the actual race becomes exciting. I won’t spoil the ending, but the last week of that journey would tax any traveler. Goodman concludes his book with a satisfying summary of each woman’s life and career after they return. This book is a fitting testament to Bly and Bisland, a page-turning true adventure and a delight to read. Highly recommended. Note: I received a free Advance Reading Copy of this book through LibraryThing.com. The opinions expressed in this review are my own. That sounds great – I’ll have to add it to my list – thank you! It is amazing how much of women’s history I don’t know or never heard of. I look forward to this read!